Even though we Atlantians complain about the heat, summer here involves tons of outdoor activities from BBQs, baseball games, concerts at Chastain, outdoor movie screenings to lunging at the pool all day. While all these activities are fun they generally include food and beverages, making it more of a challenge for those of us who are limited in our food selections. For me, this season has already been packed with outdoor events. So here are my go-to stores and restaurants for easy outdoor dining. Going to a concert at Chastain is a quintessential Buckhead activity for the summer. Even this girl who loves places like The Earl and The Porter gets some joy over decorating a table, eating great food and drinking wine while listening to oldies. If you don’t have time to cook beforehand Zoe’s Kitchen is the perfect place to pick up food. They offer a large gluten free menu with dishes that hold up well on-the-go. I like grabbing a carton of hummus with fresh veggies, chicken kabobs and some braised white beans. Grab a bottle of wine and you’re all set. 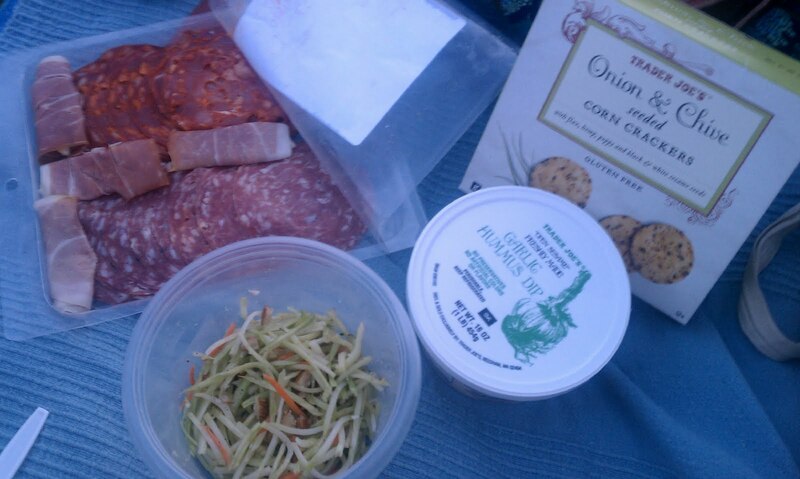 Trader Joe's and MetroFresh in the Midtown Arts center are two places I go when planning a picnic in Piedmont Park. Trader Joe’s is great for affordable snacks. They have a large selection of sliced meats and hummus. My favorite item is their Onion & Chive Seeded Corn Crackers. When I have time to stop by the house, I’ll pick up a bag of broccoli slaw mix (a mix of sliced broccoli shoots and carrots) and make a simple vinaigrette to top it off. I’ll mix olive oil, white wine vinegar, a dollop of honey, garlic, salt and pepper together for the vinaigrette, crush some almonds and toss it all together for a refreshing, hearty side. MetroFresh does a great job denoting which dishes are gluten-free, vegan and the items that contain dairy*. They post a new menu each day but there a handful of items that they always serve. I like the Mitchili (turkey chili) and the grilled chicken breast. *The menu is confusing at first because they mark GF for gluten free but D for containing dairy, not dairy free. Just keep this in mind when ordering. The staff is also very knowledgeable if you want to double check anything. Enjoying gluten free beverages at the pool takes a little more preparation since glass isn’t allowed. If you’re a cider fan, Strongbow is available in cans (22 oz for that matter) which I’ve found at most Greene’s and my local Kroger. If you’re in the mood for wine, there are always the cheap wine juice boxes you can find in grocery and liquor stores. If you want to look stylish, Sofia wine comes in cute little cans – straw included. I haven’t found a gluten free beer in a can yet. If you have please share! Whole Foods is well-known for their gluten free options. One of the things I like is that they also list the ingredients on their hot, cold and salad bars. If I’m headed to a gathering I’ll run in and make myself a quick plate of veggies and rice. If you’re on the Westside Star Provisions is a good place to pick up fresh produce, meats and to-go dishes. Yesterday I stopped by The Local Farmstand where they had beautiful blueberries, figs and tomatoes. Then I headed inside to Provisions To Go and bought two sides for a quick snack. 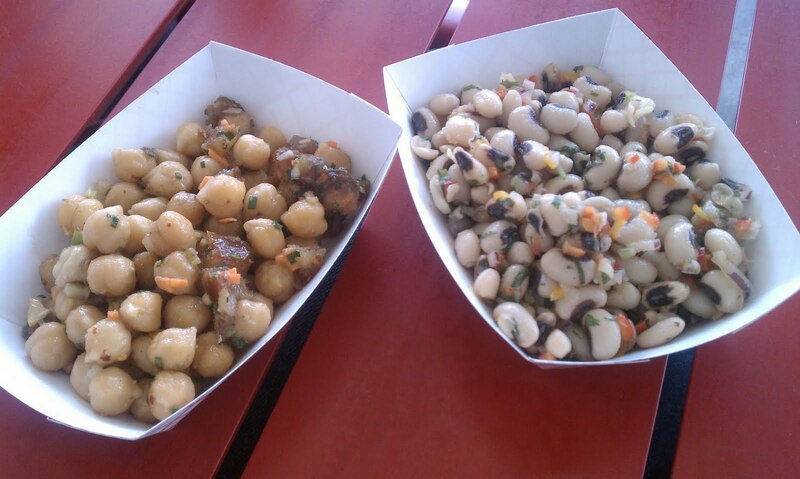 I got the black eyed peas with peppers and cilantro and an Indian chickpea salad that were both packed with flavor. The to-go menu lists the sides by the pound but they can package them in smaller sizes if you need. 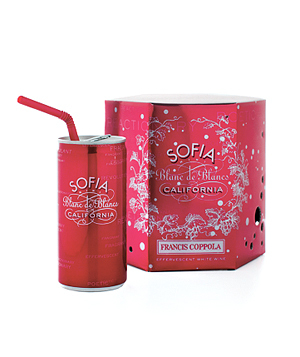 Wine in a can! Love it. MetroFresh is one of my favorites. I went to the Indigo Girls concert in the Botanical Gardens and MetroFresh does all of the food. The "From the Farm" option is GF. Good to know about the "from the farm" option at Botanical Gardens - thanks!